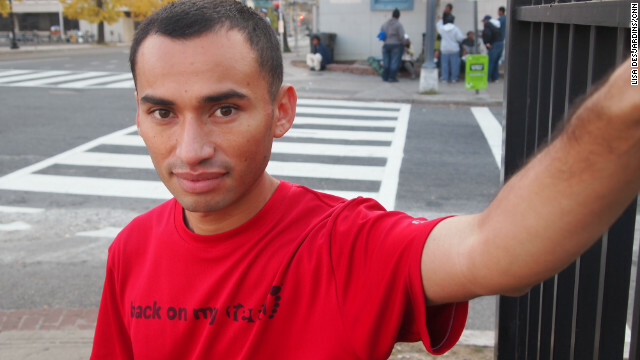 Walter Barrera, who became a marathon runner while living in homelessness, stands in front of a Washington D.C. shelter. (CNN) - Homelessness is not a cute or cuddly cause. It's often dirty, difficult and uncomfortable. And it is not something that most Americans have personally experienced. This is a problem for homelessness advocates in a time where many charities, from St. Jude’s Childrens Hospital to the Susan G. Komen foundation that fights breast cancer, nationally market and carefully strategize their messages and images. Now, some who work with homelessness are questioning how an issue that has been in the American consciousness for more than 30 years, has failed to gain more ground. And they believe one issue is the message. Anne Mahlum is founder and CEO of Back on My Feet. Mahlum thinks homelessness needs to be rebranded, to shift its focus to images of individuals. Her organization stresses examples like Walter Barrera. The 31-year-old started running with Back on My Feet while he was staying in a shelter. Two years later, he has a job and is a long-distance ultra-marathon athlete. Neil Donovan, executive director of the National Coalition for the Homeless, has been working on homeless issues for more than three decades. He rejects the phrase, “rebranding”, shaking his head at the corporate image. Donovan points out that not everyone experiencing homelessness can make the leap to marathon runner. But he agrees that homelessness needs a new message now. As potential budget cuts hang over local and federal funding, many who serve the homeless fear their cause will be too low on the priority list to keep resources. Editor’s Note: To hear more about the “rebranding” of homelessness listen to the complete story in the Soundcloud player above. My problem with these charities is what good do they actually do? Sure giving someone a hot meal and a place to rest their head is a great cause but what are they doing to get these people jobs and a home of their own? There is a reverend in St Louis who uses the homeless for political gain. He feeds them but does nothing to get them off of the street. StL tried to shutdown one of their squatting grounds and none of them actually wanted a job or to better their situation. They are not homeless. They are mobile. I agree that there need to be more individual stories, but a large part of homelessness is mental illness and drug/alcohol addiction. Until we get people help who need it so they don't fall into homelessness, it's going to keep on being an issue. This is why I no longer donate to large charities and instead focus locally..and try to donate my time more than anything...I don't trust the large charities and seeing how much their executives make I question their intentions...every charitable person I've known would balk at a 6 figure salary...in my hometown many homless suffer from severe mental illness because there is nowhere else to go..there are just a few long term mental illness centers in the whole state...and the feds just keep cutting funding...the cycle will continue for a long time..
My relatives are about to become homeless. In there case it has been because neither the husband or wife is keen on working. They have gone through tens of thousands of dollars in support from family and are still asking for more. In this case they deserve to be homeless. Sometimes being homeless is the only way to finally come face to face with money management issues and overcome them once and for all. Not every homeless person you see is 'innocent' or has suffered 'bad luck'. Trouble is with capitalism,people are so good at making money that they eventually squeeze everybody out into the streets.This is the eventuality of capitalism.Communism in it's trueist form is workable only with a small number of people because if everyone is equal and doesnt get paid money,who decides whose job it is to pick up the trash and do all the necessary but unwanted work a society needs to exist as a civilized group. Capitalism IS eventual for all societies but regulations that only favor the wealthy will undo whatever greatness capitalism can bestow upon people. I know closing all the factories in Chicago and moving offshore doesnt help.Paying sub human wages doesnt help either. Businesses want more tax breaks to expand their businesses but when they got those breaks years ago they didnt expand but instead bought homes and yachts in the islands .They didnt reinvest back home,well,our home since businessmen and women who support foreign labor are not truly Americans. How about "Homelessness...It's the new America." Homelessness is the "New World Order",how's that working for you Bush fans out there ? Soylent green is people!! It's delicious homeless peopllleee!!!! "Re-branding homelessness" = Putting lipstick on a pig. Excellent comparison! It amazes me that rather than address the issues of homelessness directly the thought of rebranding it - as if it were some commodity, is ridiculous (and I am not criticizing the project featured here... just that in many areas, like Venice, CA, getting homeless shelters approved has been insanely impossible!). There are so many good organizations trying to address the issue with sound principles and hard work - only to be set back by local government, businesses or home owners. Sadly, many do not feel a sense of compassion toward those who are homeless (and not all homeless people are drunks, drug addicts or lazy.... far from it). We are in this world together, we have a duty to help each other and yet, instead there is so much judgement passed, so many incorrect assumptions made... one would think in our great nation we could do better. I guess I am what many would call a bleeding heart liberal and I am not really.... I just believe we could make choices that would be helpful to all of us... like maybe demanding accountability for the mortgage fraud situation that left so many families out on the streets and homes abandoned! And yes, I work with the homeless on Venice boardwalk... not with an agency because there aren't any to work with here on the boardwalk.... several of us just do what we can to help. As someone who has worked for 40 years trying to help provide affordable housing for low income folk including the homeless, I'd feel better about trying to find new ways to raise more money if the moneys that are already available weren't so often squandered. The City of San Francisco is helping to do a rehabilitated building for the “chronically homeless” at $500,000 per little unit. Over in Oakland, they are doing a couple of similar rehabilitated buildings for over $250,000 per little unit. You can find other examples like these all around California. In many cases, the homeless housing programs have become a gravy train for the non-profit developers and their professionals who are supposed to help the homeless but seem to do quite well for themselves. Heat up the irons, it's time to "rebrand" the spin doctors and pigs troughing on the disenfranchised in our nation. Re-brand homelessness as failure of capitalism and the American Republic. Most people do not know that the majority of homeless are either drug or alcohol addicted and many have been released from mental health facilities over the last few years. They have chosen to not enter mainstream America. Many homeless refuse to enter shelters, accept assistance, or detox. That's actually not a true statement. There are thousands upon thousands of people that are drug/alcohol addicted that are experiencing homelessness and others that are housed, so that's not necessarily of factor of homelessness. They are finding that there are three factors that create homelessness: access to health care, lack of a living wage, and no affordable housing. There's a percentage of people experiencing homelessness that actually work, but their jobs don't pay them enough money to provide food AND shelter. Many have to choose one or the other. If they get sick, they end up losing their jobs for the time off taken. Also, not all choose not the enter "mainstream America". Some of them have suffered traumatic experiences and are afraid of "mainstream America". Violence against people experiencing homelessness is actually on the rise because people think violence against "them" doesn't really count. Many people living on the streets suffer from PTSD and don't have access to medication or behavioral health so they self-medicate with alcohol. The problem of homelessness is not a simple one. It's got so many variables. Yes, there are some out there that are thieves, but I've actually known a thief or two and they were housed. I've known a number of "violent people" but they also have been housed. Look deeper into its causes. It's not just one reason. It's just one stereotype. "They are finding that there are three factors that create homelessness: access to health care, lack of a living wage, and no affordable housing" – Again, this is mental illness. If there are no jobs you can get that can pay for housing in a given area sane people move to a better area. Only those who are mentally ill stay and be homeless. "Many people living on the streets suffer from PTSD and don't have access to medication or behavioral health so they self-medicate with alcohol" – Again, mental illness and these people were institutionalized before someone decided it was better to "free" them and put them on the street. Again, the chronically homeless almost always have mental illness. Those without mental illness may find themselves homeless temporarily for one reason or another, but they do not remain homeless and do not remain in an area that doesn't have jobs for them. Bs1 – what is your opinion of the ADA? Do you believe that mental illness is the way to wash our hands? Do you believe in science? Mental illness is a product of bio-chemical processes as are many, many dieseases that effect other vital organs. Is the brain a less deserving organ? Unskblraidr – My opinion on the ADA is not good. Everyone deserves equal access and forcing the expenditure of significant resources to provide unequal access for a specific minority is in no way equal access. As I noted in a prior post the bulk of the homeless population is mentally ill and used to be institutionalized where they received shelter, food and care until some liberal types "felt" they should be "freed" without giving the issue any rational analysis. You do realize that the 'someone' who 'freed' the mentally ill was Ronald Reagan, don't you? He closes all the mental institutions and threw all the mentally ill onto the street. That is a misconception. While the majority of severely drug and alcohol addicted people might be homeless, the converse is not true. A large number of homeless people suffer from schizophrenia. Others are the ones you don't see, who have nothing wrong with them except for the fact that they can't find employment that's gainful enough to afford housing. They do their best to keep themselves clean and usually blend in with the general population. He doesn't like rebranding, but thinks it needs a new message. Isn't that the same thing? Sounds like he's jealous he didn't get to the idea first and some 28 year old marketing guru from the midwest stumbled onto something in a few months, he'd been waiting years for an idea about.